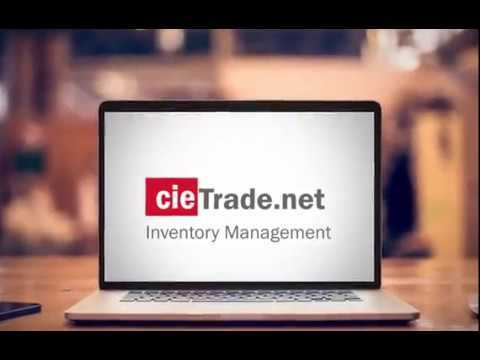 cieTrade.net is a business management and inventory control software for commodity trading and recycling companies. A cloud-based SaaS product, starting pricing supports access for 3 users with additional enterprise-level options available on request. Designed to maximize operational productivity, the online dashboard-based system promises to eliminate spreadsheets with automated data entry that can be accessed from any location, leveraging built-in workflow tools for tracking shipping status, billing tasks and claims etc. A unique "buy/sell" approach streamlines brokerage shipment details into instantly retrievable forms, while index formula and differential pricing is supported alongside the logging of all order activities and pricing histories. Shipping and billing documentation, however specialized, can be generated faster from customizable templates, while automated email also uses a template-based tool to send custom messages with multiple file attachments. Aside from core trading, export and inventory control features, cieTrade.net also delivers payment processing, shipping statement creation and advanced reporting capabilities for tracking a multitude of business performance trends. Integration with leading third-party accounting packages such as QuickBooks and Xero then ensures financial data is synchronized accurately while eliminating double entry. In addition to online system access, cieTrade.net is also supported by a suite of native smartphone apps for iOS and Android platforms. For iPhone and iPad, cieMobile gives mobile access to cieTrade accounts and reporting information including contact details, accounts receivable, open shipments or orders and more, along with revenue updates and email/phone communication from within the app. Truck Drivers can manage cieTrade dispatch jobs and view drive directions remotely with cieDispatch, while ciePhoto allows photographic evidence of shipments or issues to be snapped, tagged and uploaded to the main database. There are currently no reviews of cieTrade. cieTrade.net is cieTrade's cloud-based trading and inventory software, providing a SaaS solution for up to 3 users and beyond with unlimited trades, orders and document attachments, multi-currency support, plus a built-in CRM for job tracking and notes / photo capture. Accounting integration promises to make manual data entry redundant and eliminate errors by automatically synchronizing data with third-party solutions including QuickBooks Online and Xero Accounting. Bespoke shipping and billing documents can be generated from customizable templates, while email integration also automates correspondence with user-defined templates with custom subject lines, message content, multiple photos and file attachments. Advanced reporting and analytics capabilities provide real time data visualizations and dashboard summaries for gross profit trading by customer, supplier and product, plus sales rep performance tracking and tonnage / margin trend insights. Supported by a free suite of native smartphone apps for iOS and Android devices, including cieMobile for remote access to cieTrade account information, cieDispatch for driver management of dispatch jobs and ciePhoto for the capture and upload of export shipments or quality issues. Below are some frequently asked questions for cieTrade. Q. What type of pricing plans does cieTrade offer? Q. Who are the typical users of cieTrade? Q. What languages does cieTrade support? Q. Does cieTrade support mobile devices? Q. Does cieTrade offer an API? No, cieTrade does not have an API available. Q. What other apps does cieTrade integrate with? Q. What level of support does cieTrade offer?